Tornadoes ripped through the Southern Plains on Monday as storms that killed five people and injured dozens more blew cars off highways, toppled homes and sent baseball-size hail crashing through windshields. Oklahoma Department of Emergency Management spokesman Jerry Lojka said two people were killed in Oklahoma City and three were killed in Cleveland County, south of the city. Oklahoma City officials said the fatalities there involved a young boy who was hit by debris in his home and a man whose recreational vehicle flipped over on top of him. Details on the Cleveland County deaths weren't immediately available. Officials reported that at least 58 others were injured - two of them critically - in the daylong onslaught. In some neighborhoods in Oklahoma City, emergency workers were going door to door to make sure everyone was accounted for. The storms were part of a violent weather system that also spawned twisters in Kansas and that forecasters had been predicting since last week. 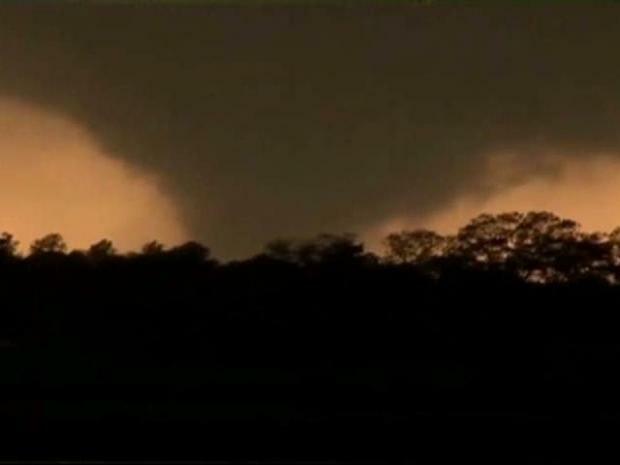 Tornadoes touch down in Oklahoma causing widespread damage. "You could just hear stuff hitting the house," Linda Sugg said, who rode out the storm in her home in Norman, the largest city in Cleveland County with about 106,000 residents. After the weather cleared, she walked through her litter-filled front yard, picking up debris. Power was out to more than 37,000 homes and businesses statewide. Many Oklahoma residents had been prepared for the bad weather. TV broadcasters dedicated their entire day to storm coverage, with some showing live video of the twisters as they rolled across the countryside. "In 30 Seconds, It's Gone"
Residents in Oklahoma are picking up the pieces and thinking about rebuilding after a tornado outbreak May 10, 2010. "The kids and I got in the closet and prayed," said Jamie Keyes, of Norman, about 20 miles south of Oklahoma City. "I heard a hiss. It was like something was whistling very loud," she said. "We're all very fortunate." Near Seminole, about 60 miles east of Oklahoma City, at least two homes were leveled after a tornado went through, Emergency Management Director Ernie Willis said. Emergency responders were going through the area to determine if anyone was hurt or trapped, he said. Widespread destruction led authorities to close Interstate 40, a major east-west route, just east of Oklahoma City. Traffic was backed up for miles. 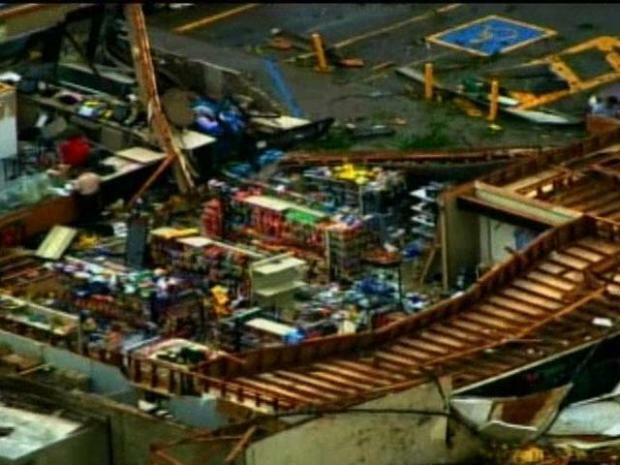 A Love's truck stop took a direct hit. "Miracle of all miracles, we don't have any injuries from that location," Love's spokeswoman Christina Dukeman said. "We will rebuild and reopen." 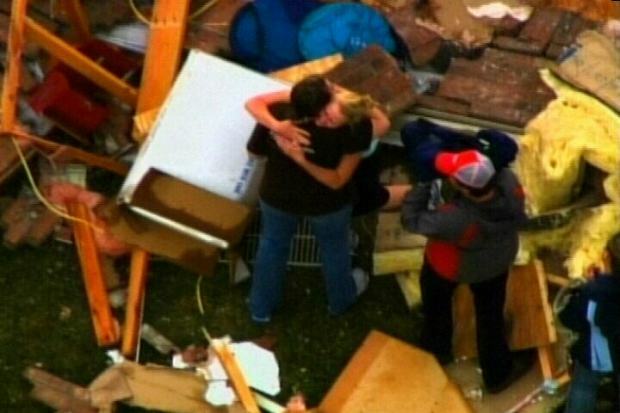 Tecumseh, 40 miles southeast of Oklahoma City was also hit hard. Storm trackers capture amazing video from Monday's tornado outbreak in Oklahoma. "It's gone, in 30 seconds, it's gone," said Holly Starky who rode out the storm in her bathroom. "After I got out of it, then, I thought, 'Why didn't I die?' It's devastating, I mean, I don't know why I lived." Lynann Moore's family rode out the storm in an underground shelter. "The main thing is our kids are safe, and the storage shelter was worth its money," said Moore. Residents spent Tuesday picking through what was left of their homes for anything they could salvage. "You know, we're all safe. Nobody got hurt. And we thank God for that," said Laura Watts. "It's going to be years before we get it back to where it was. I'm just thankful to be alive," said Starky. Interstate 35, which runs from Mexico to Minnesota, was also closed briefly at the Kansas-Oklahoma border because overturned tractor-trailers blocked all lanes. At Moore, near Oklahoma City, trucks were overturned in the median, but the road remained open. Oklahoma City and its suburbs saw three storms develop just to the west and each caused damage as they moved across an area home to 1.2 million people. The northern storm caused property damage near Edmond; two storms to the south turned into killers. "We've had a very strange event: multiple tornadic portions with this event as it came through," said David Barnes, the emergency management director for Oklahoma County. "We have multiple vehicles overturned, a housing addition has had multiple homes destroyed." In Alfalfa County, Sheriff Charlie Tucker said hail as big as baseballs broke the windshields of numerous cars and damaged some homes. "I came home once to look at my own personal vehicle and the windshield was all bashed out. The grandchildren's swing set was up and now it's gone, so there was straight-line winds that came through," Tucker said. The Storm Prediction Center at Norman had predicted the outbreak, saying the atmosphere had the right mix of winds, heat and moisture. One twister touched down just east of the center's building on the University of Oklahoma campus. NBCDFW's Scott Gordon contributed to this report.